The Aaron A1250 is a multipurpose electrosurgical generator suited to a modern physicians office or surgical center. It features 120 watts of cutting power along with blend, coagulate, fulgurate and bi-polar modes. 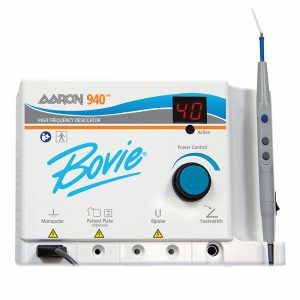 The A1250 as with all the Aaron range comes ready for use with supplied with a disposable hand-piece, electrodes, wall mounting and an instruction DVD. 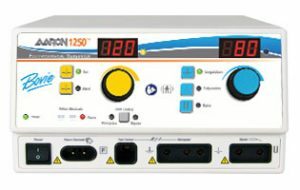 The Aaron 1250™ Generator offers you up to 120 watts in cut, blended cut and pinpoint coagulation mode. Power control at the hand-piece or via the rotary knob adjustable in 0.1 watt increments and 6 available preset modes make this very easy and efficient to use. 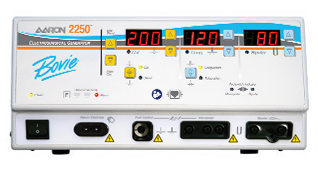 The A1250 also incorporates extra safety features such as self testing circuits, isolated circuitry, audible tones, discreet outputs and Bovie neutral electrode monitoring. fault alarms and is designed with an isolated RF output.